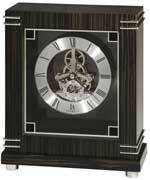 Black Coffee finished mantel clock on select hardwoods and oak veneers with polished chrome-finished, plated metal feet. 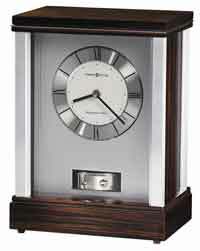 Features flat glass over the dial, accented by a black border with white dot pattern and polished black and chrome-finished square embellishments on the corners. White dial with applied polished chrome-finished Arabic numerals and bar hour markers, black hour and minute hands, and a silver-finished seconds hand. Quartz, non-chiming battery-operated movement requires one AA sized battery. 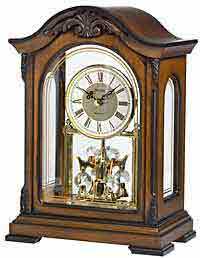 Size: Height 9.5" Width 9.5" Depth 4"
Clocks for sale at The Clock Depot including the 635-185 at discount prices.